First of all, control in this sense means closed-loop control. That is, the controller has some feedback or idea of the reaction of the device being controlled. An example is a motor being controlled while the controller is using a sensor to determine its speed. Below is a diagram of a traditional PID controller. P stands for proportional, I stands for integral, and D stands for derivative. Using our motor example, in the diagram the set point would be the desired motor speed programmed into the controller, the process would be the motor and the output would be the actual speed. The three boxes P, I, and D together represent the controller. Each of the three parts have a constant coefficients Kp, Ki, and Kd. These constants are the tuning values and represent how much the process control relies on the P, I, and D. For one process the Kp, Ki, and Kd values might be one set value, but when the process is changed to a different motor, for example, the set points might be different. It is also common that one of the coefficients be set to zero so that it isn’t really a PID controller but maybe just a PI controller. Finding these K values has become somewhat of a black art in industry and is called tuning the control loop. From the instruction set reference manual for the MicroLogix 1100, below is the PID command. As seen above, the PID command contains a file number PD8:x just as a timer would. It uses a process variable, that is, the measured output of the process, such as the motor speed. It also has a control variable, such as the output to the motor that controls the motor speed. 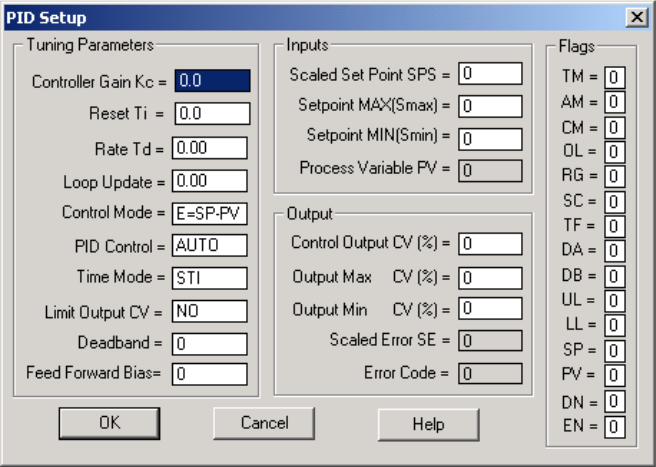 In order to setup the controller the setup screen is entered and is displayed below. Inside the setup there are several numbers that need to be determined. The Kc, Ti, and Td are the Kp, Ki, and Kd discussed above. I encourage you to read through the descriptions of each of these items beginning on page 282 in the manual before continuing. 1. What does PID stand for? 3. What does “tuning the loop” mean? 4. What is the “Process Variable” in the PID command in the MicroLogix 1100 PLC? 5. In the PID command, what is Td? 6. In the PID command, if Ti is set to zero, and Td and Kc are positive numbers, what type of controller is being represented?